Investigation suggests suspects’ link with organisation whose members are under the lens in the Gauri Lankesh case. Mumbai: The Maharashtra anti-terrorism squad (ATS) claims to have averted terrorist attacks with the arrest of three people. The trio includes a self-styled cow vigilante identified as Vaibhav Raut; a right-wing activist, Sudhanva Gondhalekar; and a farmer’s son, Sharad Kalaskar. The squad reportedly recovered a huge cache of explosives from the suspects. “The arrested accused and their associates have formed a terrorist gang with an intention to challenge the unity, integrity and security of the country and planned to manufacture bombs for which they collected and illegally stores necessary raw material and finished products,” the ATS said in a statement Saturday, adding that further investigation was underway. 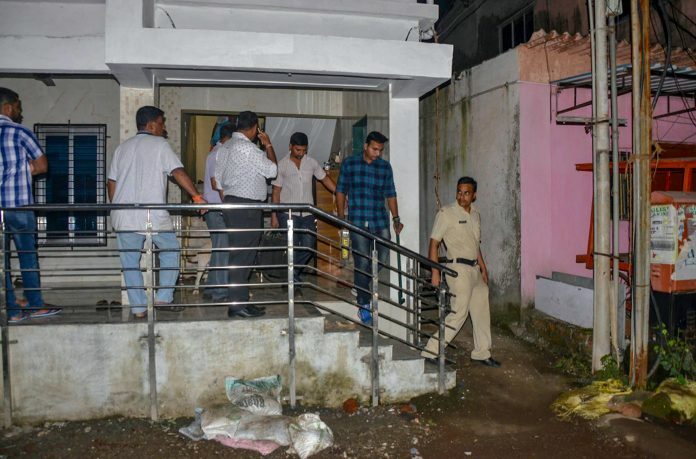 Two of the three — Raut and Kalaskar — were arrested from Nalasopara near Mumbai, allegedly with a cache of 20 crude bombs, two gelatine sticks, four electronic detonators, 22 non-electric detonators, two bottles labeled ‘poison’, batteries, safety fuse wires, different powders, blades, circuits, and switches. They reportedly also had a piece of paper with a hand-drawn circuit diagram. Gondhalekar was arrested from Pune. According to the ATS, he revealed during his questioning that he had “clandestinely stored weapons”, following which the squad seized 11 country-made pistols, an airgun, 10 pistol barrels, six pistol magazines, partially made pistol bodies, a trigger mechanism, several partially made parts of fire arms, a handbook on making explosives, CDs, and pen drives. Raut, 40, lives in a two-storied house with his mother, wife and two young children in Sopara village. Though a real estate broker, he is more popular as a staunch Hindutva activist and ‘gau rakshak’ who works as a coordinator at an organisation named the Hindu Govansh Raksha Samiti. “On every Hindu festival, Raut carries out strong propaganda. He puts up boards at every street corner and the messages are often provocative,” said a local. “He is very well known locally and has maintained good relations with the people as well as police,” the local added. A few years ago, when Raut found himself facing a police case following a skirmish with meat traders, a number of right-wing activists held a one-day bandh at Nalasopara in his support. Right next to Raut’s locality is a colony dominated by Muslims. “During any major Muslim festival or event, police usually send Raut a precautionary notice asking him to stay away from the area,” a local said. Raut also actively participates in events, protests and programmes of the Hindu Janajagruti Samithi (HJS), which works with a stated aim of uniting Hindus and spreading education and awareness on ‘dharma’. While he has worked with and shared stage with a number of members of HJS affiliate Sanatan Sanstha, a right-wing outfit, people known to Raut and activists from different Hindu organisations say he was not a member. Incidentally, suspects being probed for the murders of rationalists Narendra Dabholkar, Govind Pansare and M.M. Kalburgi and journalist Gauri Lankesh have been found to have links with the Sanatan Sanstha. His friends and neighbours expressed shock and disbelief at Raut’s arrest, saying that, though an aggressive gau-rakshak, he was “very peaceful and patient”. “He is a very calm and decent man. He has never been rude to anyone. He is a typical family man and enjoys a certain status in society,” said neighbour Manoj Patil. Gondhalekar, 39, lives in the Dhayari area of Pune, from where he was arrested in the wee hours of Friday. He was once associated with the Shivpratishthan Hindustan, but reportedly hasn’t been an active member for more than a couple of years. The organisation was founded by Manohar Bhide aka Sambhaji Bhide, who was among the accused in the 1 January Bhima Koregaon violence until the Maharashtra government gave him a clean chit citing lack of evidence. Dalvi described Gondhalekar “as a very learned man with deep knowledge of the Hindu religion, spirituality and dharma shastra”. Gondhalekar is also known to have actively worked for Shivpratishthan in rescuing cows and opposing their slaughter. In 2016, Gondhalekar, sharing the stage with members of the Vishva Hindu Parishad and the HJS, accused Dabholkar’s family of mismanaging funds at the Andhashraddha Nirmulan Samiti, an anti-superstition organisation founded by the doctor. People known to Raut said that it was around this time that he went off social media, deleting all his posts and photos from Facebook and never tweeting again. Raut and Gondhalekar’s third aide, Kalaskar, 25, seems to be the least known among them, even in Hindutva circles. The elder son of a small-time farmer, Kalaskar reportedly hails from Kesapuri village in Aurangabad district. After he completed his Class XII, he moved out of his village in search of work. Speaking to television channels Saturday, his younger brother said they were under the impression that Kalaskar had been in Kolhapur trying to start his own business. “We got a call from the ATS saying he has been arrested, but could not figure out what it was about. We heard about the arrests on the news and realised this seems to be a serious matter,” said Krushna Kalaskar. “I would only like to say that the ATS should investigate properly and take action only against those guilty. They should not trouble those who are innocent,” he added. “Gondhalekar, till a few years ago, was active with the Shiv Pratishthan Hindustan. I have known Raut too and attended many meetings and protests with him. So though these people are not from our organisation, we are not going to disown them,” he added.